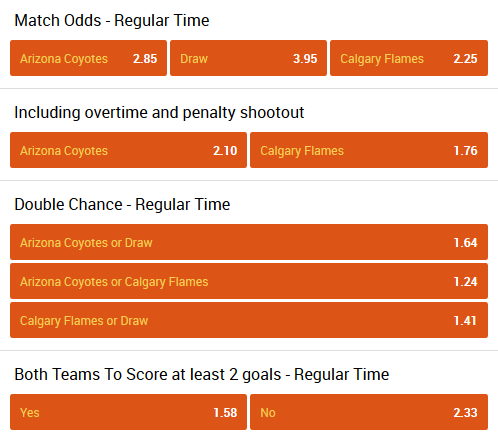 Hockey betting odds Arizona Coyotes – Calgary Flames. If you have problems, and you can not solve them in any way, then try to bet on hockey. It’s still the easiest way to earn a decent amount of money on the Internet. So hurry, because the NHL season is coming to an end. Since 1996, the clubs have played each other 85 times. Arizona Coyotes won in 42 games, Calgary Flames won in 39 battles, and 4 times the forces were on par. Arizona Coyotes played in the current season 71 times, and scored 57 points. With this indicator, the team is located on the last fifteenth place in the West. Arizona Coyotes could not beat the opponent in 48 battles, but 23 games they managed to win. In the last two meetings, Arizona Coyotes was able to beat Nashville 2:3 and Minnesota 1:3. Calgary Flames earned in 72 games, 80 points. But this is still not enough, that would have the team got into the playoffs. Now the club is on the eleventh line in the West. Calgary Flames were stronger than the opponent in 35 games, and in 37 games they lost. In the last five confrontations, Calgary defeated Buffalo 5:1, Ottawa 2:1 and Edmonton 1:0, but lost to Islanders 2:5 and San Jose 4:7.